Today we have a Champion 600 5B1 model tweed Fender Champ. This amp is serial number 4082 (as indicated on the tube chart). This tells us this amp was probably made in late 1952. The tube chart doesn’t have the date code stamp so the serial number is as close as we’ll get. This amp still uses the “600″ designation on the control plate. Being a wide panel tweed cabinet, we know that this is one of the earliest wide panel Champs. Later ones featured the “Champ-Amp” logo in its place. Note the old style block Fender logo (not the script style logo of later models) and linen grill cloth (not the oxblood grill cloth of later models). The handle and power cord look like they have been replaced at some point (not all that uncommon). This amp recently sold for $590. 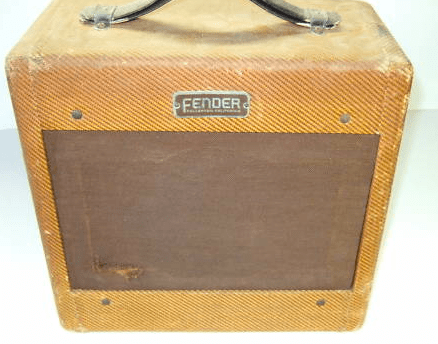 Own a vintage Fender Champ? Want to share photos of it with the world? We’d love to hear from you, drop us a line with the form below.